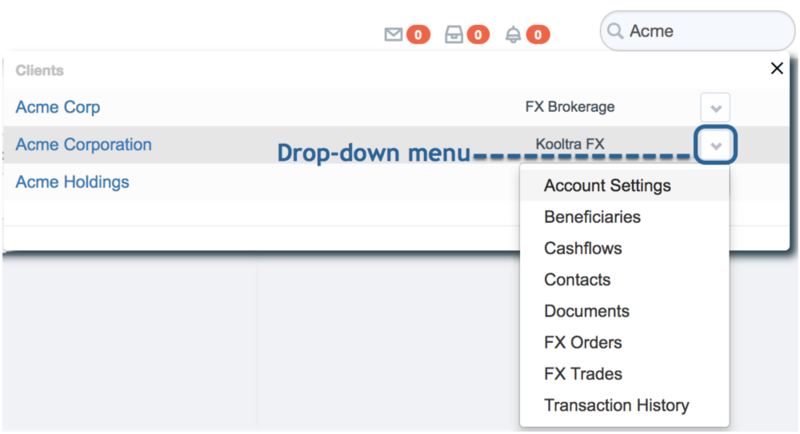 Shortcuts to action items such as viewing Contacts, Beneficiaries and Cashflows are built into the global search and can be accessed by clicking on the downward arrow beside the search result. This global search is a smart search so you can find an account called Acme Corporation by typing Corporation or Acme. Click on the search results or on the dropdown arrow to access more information about the search result. The local search bar in Kooltra allows you to search on the values in a card. The local search bar also has the capability to do advanced searches using the AND and OR Operator. AND Operator: To use the AND Operator in a local search use '&'. For example, searching "USD & CAD" will return only USDCAD trades. OR Operator: To use the OR Operator in a local search use '|'. For example, searching "USD | CAD" will return only any USD or CAD trades.